I am always thinking of easy to make appetizers to serve at parties. We need quick and easy appetizers so we can focus on the important things like visiting with our guests. This is one of my favorite go-to appetizers and is always a hit among guests. Preheat oven to 350º. Line baking sheet with foil. Break off the end of asparagus spear, and trim the bottom edges if needed. See this guide on prepping asparagus. Cut ham slices in half. 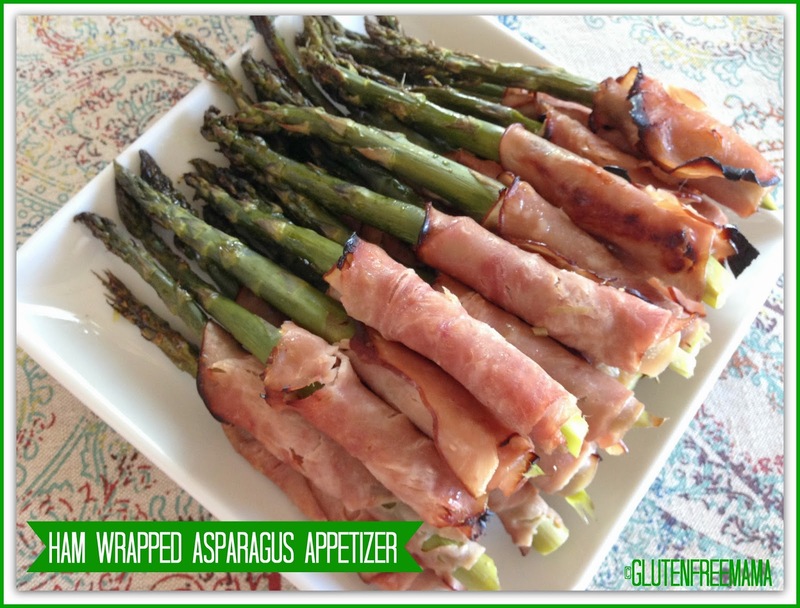 Wrap the bottom half of each asparagus spear with ham. Drizzle the top half of asparagus spears lightly with olive oil. Sprinkle lightly with sea salt. Bake for about 20-25 minutes, or until asparagus becomes tender and ham is slightly crispy or browned on the edges. Perfect Gluten Free Appetizer for parties and get-togethers or serve as a side dish with holiday dinners. Break off the end of asparagus spear, and trim the bottom edges if needed. See this guide on prepping asparagus. Cut ham slices in half. Wrap the bottom half of each asparagus spear with ham. Drizzle the top half of asparagus spears lightly with olive oil. Sprinkle lightly with sea salt.